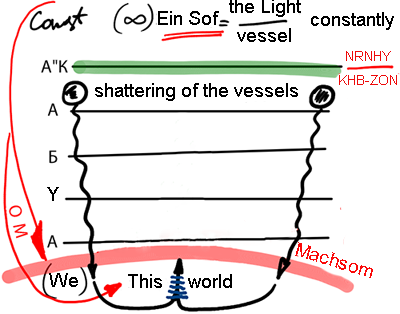 The wisdom of Kabbalah describes creation from the level of Infinity (Ein Sof). In Infinity everything exists and Infinity exists in regard to the Creator. In Infinity, the Light and the vessel are found in a wondrous oneness, for they are equal, support each other, and shape each other because there is no Light without a vessel and there is no vessel without Light. They exist in a permanent state. And in continuation, in order to acquire a vessel that was created in Infinity and is found in unity with the Creator in awareness and understanding of its state, five worlds (concealments) were created: Adam Kadmon (AK), Atzilut, Beria, Yetzira, and Assiya (ABYA). And this world is found under all the worlds, detached from them. We are completely detached from the spiritual system, not understanding at all where we are found and what happens there. The border that passes above us is called the Machsom. It determines the reality within which all of us are born and live, the present level of development from generation to generation. A single Infinity fills the entire Infinity. And the Light of Infinity bestows to us in the form of Ohr Makif (OM), which awakens us to evolve. We depend upon it, and in the present stage it is up to us to learn to find a common language with it. We must know how to awaken its influence on us, how to approach it, as a result of whatever actions it bestows upon us more or less. It is necessary to “play” with it all the time, to accommodate ourselves to it. Just as a person exposes parts of his body to the sun in order to get a tan, exactly like this it is up to us to work internally regarding the Ohr Makif. We still don’t know how to approach the influence of the Light maximally; its influence is always positive; it is always for the good, granting us happiness and wealth in every sense, truly with total bestowal. But in the meantime this is Ohr Makif (Surrounding Light) for us, because we have not accommodated to its inner characteristic. The guest must be like the host. The host provides everything for him and only wants to give more and more, and the guest is ashamed, he is not prepared to bear this. So he makes a restriction on himself and says that first he must build himself according to that law in order to bestow back to the host. Only in such a circumstance and to this extent can he receive all the goodness from him. That is how we receive Inner Light from the Creator, to the degree that we are ready to bestow to Him. And this is possible only in relationship to someone who loves you. When I bestow to a person whom I love, I enjoy my bestowal, like a mother who takes care of her child. Giving is a sign of love. Therefore, if we accommodate ourselves to the love that we expect from the Creator, we will feel it. How do we attain it? How is it possible to be a guest who knows how to respond to a relationship with the host? How do we learn what giving is? Because I don’t know what it is now; for I am entirely immersed in narcissism, in reception for myself. Here I can only use the preparation that made the spiritual vessel that was in connection with the Light from the start. Then the vessel went through a shattering, shattered itself into fragments in order to discover how much it differs from the host. It wanted to discover the evil in itself because only in this way could it resemble the Creator. Previously, in the world of Adam Kadmon, a “division” was made in the Light into NRNHY and a division of the vessel into KHB and ZON. And in continuation, between the worlds AK and Atzilut the breaking of the vessels was made. And the one great vessel was divided, broken into a multitude of parts, each one of them closed in upon itself, within its ego, within a desire to receive for itself. It was closed in such a way that it was not ready; it was not prepared to feel the “other.” It only feels what happens within itself. This is its nature. All the billions of vessels descended until they fell into this world and our universe was created from them. And later on the matter of the universe began to develop from below to above already. During the course of this process the planet Earth was created and upon it the plants, the animals, and the human species evolved. That is how evolution continued in our world, the sparks that fell from above began to connect between them into blocks of matter, stars, planets, and galaxies, and after that on the face of planet Earth into various natural forms of plants and animals of which we are a part. If previously there had been a process of fragmentation that was a result of the “breaking of the vessels,” now this is talking precisely about the connection of substances, components. The vessels fell and began to connect with each other. For this they were not required to carry out actions with consciousness and understanding. On the levels of the still, vegetative, and animate, the particles connected themselves into atoms, the atoms connected into molecules, and the molecules connected into more complex structures, into biological bodies. So, gradually the matter of the still transformed into the matter of vegetative and animate. But the level of man doesn’t belong to our world; it is still ahead of us, and in the meantime, we are a more developed part of the animate world. Our lives are subject to precise principles: all of us do what brings us the most benefit. Each one acts according to his personal good. It is clear that we try to “get along” with each other, so that we don’t “eat” each other, but in the end, in spite of it all, each one of us is concerned about himself. This is our program. That is how we find ourselves in opposition to the Inner Light. But the Surrounding Light acts upon us in a unique form, and in spite of it all advances us towards greater connection. This is even though we are made more and more egoistic through connection. The substance of the still is satisfied with existence; it only keeps itself from destruction; therefore, in order to shatter it, a power that is higher than its egoistic power of preservation is needed to act upon it. It has no other shortcomings. The vegetative substance is not satisfied with this; it wants to grow, to breathe; it discharges what is harmful and absorbs what is beneficial; it spreads and multiplies. The ego of the vegetative substance is different from that of the still. That is how the Surrounding Light inserts its energy, connecting more and more fragments, more and more components, constructing living cells that multiply, feel the environment, and learn to use it for their development. On this level the ego is already connected to the environment. The animals are not only aware of the environment, they also move from place to place, produce offspring, and are concerned about them. In other words, within their ego is rooted the power of giving that is intended for their use. And we humans exploit the environment even more on all the levels of the still, vegetative, animate, and speaking. You see our ego is more developed, and in addition, it continues to develop. Animals don’t develop like us; they simply become extinct and in their place other species come. On the other hand, people change from generation to generation with increasing speed. Five hundred years ago a son was like his father, and the grandson was like both of them, the same life, the same profession, and the same clothes. But today people are changing all the time; it is as if they are reborn. Essentially, his life is spread over a number of generations. Why does the Surrounding Light work on us, manage us in a form like this? In order that we will become more and more complex. The more complex the structure, the more difficult it is to be concerned for it and to support it. The more complex the connection between the desires, the more egoistic they are and they acquire greater inner powers. They see the external world more and more egoistically, searching for the opportunity to exploit and profit from everything. Ideally, we would like to scoop the whole world into our hands. The Surrounding Light created us like this. Today this has brought us to a crisis. Nature, or in other words, the Light or the Creator, has brought us to the maximum of our original nature, but we discover that as a result of this we feel worse. Apparently we have no more stock of positive forces that will make it possible for us to get along with each other and receive almost optimal pleasure. In fact, we would like to move the process in other lines; it is clear to us that it is worthwhile to give children the best education, to strengthen the institution of the family, to correct ourselves so as not to be aggressive, to build a society that is friendly, egalitarian, better…. But everything is going in the opposite direction, and a minute percentage of the rich control half of the wealth of the world. They are themselves afraid; they don’t know what to do, but on the other hand, they are not ready to give that up, they are not ready to distribute anything. All of their kindness is directed towards self-benefit in order to soften and straighten out the situation and no more than this. But even in this they are unsuccessful. And so, in the end, the Surrounding Light brings us to the “recognition of evil.” Therefore many are asking the question, “What is to be done?” “What kind of a life is this?” Many enter into despair, use drugs, tranquilizers, and antidepressants. Medications like these are even prescribed to students in school, and recreational drugs are sold to everyone; the main thing being for a person to relax and die quietly. This is not done maliciously but from a lack of choice. And all this is a result of the influence of the Surrounding Light. For it must show us our true state. So with its help we have reached some kind of understanding of evil, asking about the meaning of life. Questions like these push particular people to suicide, to murdering other people, or using drugs and so forth. And there are those who understand the main question with a little more sensitivity. This depends upon the Reshimot, on the spiritual gene, that is inherent in a person and makes a new feeling possible. There must be a solution, an answer to all of this. I must reach a particular source that will truly give me an answer for why I am living and what is the reason for my life. Or with the help of the group, together with the Surrounding Light, we consciously participate in the process with understanding and emotion. This is to say, we must be connected with the Surrounding Light. It is up to us to understand how we influence it and how it influences us, and how it is possible to control our evolution with its help. From now on we receive free choice. Therefore, it is up to us to think only about how it acts and how we can change and hasten its activity. This is what it is up to us to learn; therefore, it brings us to the place of learning. 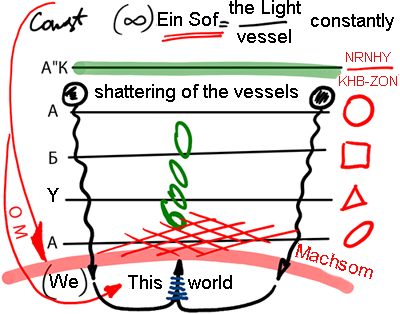 Here they explain to us that in the end it is up to us to carry out the activity of the Surrounding Light. Just as it gathered matter, formed more and more complex structures, so we must also continue the work. We continue to do that with ourselves, with the help of the means that are standing at our disposal. The Light brings us to a group, and I must work for the sake of connection in a group as one body, one system. That is how I advance together with it, and then I see a partner in it. Now it no longer pushes me towards something; rather, I use it not as an opposing force but as a helping force that is found in my hands. And essentially this is the entire wisdom of Kabbalah. It tells how to utilize the connection between us from now on so that the Surrounding Light will help us. The small connection that there is in the beginning will expand more and more until it encompasses all the people in the world. And then we will go back in that way to Infinity to complete connection. If we don’t succeed, don’t want this, then in spite of it all, the Surrounding Light will correct us, will act as, “He hath made a decree which shall not be transgressed” (Psalms 148:6). You see it is up to us to reach the final correction during a defined period of six thousand years. Many things have already been done and a little more is left for us. Through the connection between us, with the help of the Surrounding Light, we must bring ourselves to accommodation with the characteristic of the Inner Light. The essence of the Inner Light is bestowal and love. We don’t know what this is. Here we must understand that there exists a unique “network,” model, pattern, in the whole world, and it is up to us to connect to a group in accord with this, all the time anew. In the world of Assiya we are connected into an “ellipse,” in the world of Yetzira into a “triangle,” in the world of Beria into a “square,” and in the world of Atzilut into a “circle”—all the time the link between us, the group connection, receives a new form, more and more qualitative. If we try to do this, we seemingly insert ourselves into some kind of “pattern.” This is not easy, not pleasant, not good, but there is no choice, for we must be more and more “attached” to each other. Each one “polishes” himself, contracts himself, and becomes more and more integrated with others. And so time after time we insert ourselves into the pattern of connection more and more qualitatively. And the Surrounding Light helps us with this. If we invest effort in order to enter into the pattern, then it will help us. It helps us even if we make a mistake; it pushes us almost as well as a school teacher. But if we become lazy, its influence becomes negative and brings us to a state opposite to the state we must reach. So without a choice we learn what is positive from the negative. One way or another, everything is done with the help of the Surrounding Light. “Raising the prayer” is the shortcoming that we discover in regard to the Surrounding Light. And the “answer to prayer” is the Light that comes to us and pulls us forward. During this process we advance. The main thing is to remember and imagine to ourselves at every moment that it is up to us to accept a new form of connection. We enter into a new pattern all the time: So I mold myself, create myself, depart from the material of my desires and see in it the material where I am the maker. This is exceptional work, work that causes unbelievable pleasure, pleasure on the level of the Creator who molded the creation. This is the Upper Light, the Light of NRNHY, that arrives and fills us. There is no greater pleasure in all of creation than seeing ourselves as a creator. On the one hand, you recognize the material because you are found in it, and on the other hand, you contract yourself, go out of it, and begin to work on it from the outside in order to put the “donkey” into the “stable,” into the right pattern: ellipse, triangle, square, or circle. Clearly, this is not talking about geometric shapes, rather about characteristics; they are born in us and we give birth to them one from the other and feel that we have changed. This is truly unique work, a great gift from the Creator that makes it possible to feel what it is to be a creator. And all this is incumbent upon us. And at the end of the way, after we have built the image of the Creator from ourselves, we feel and understand the entire creation and reach adherence, which is the essence of the final correction and the goal of creation. When we begin to work on Arvut (Mutual Guarantee) within a group, we understand this goal and work all the time in the presence of the Surrounding Light and are directed towards the Inner Light, aspiring to be like the Inner Light with the help of the Surrounding Light. And while advancing, we understand more and more that “there is none else besides Him.” He acts within us, He awakens all of the thoughts and desires within us, He gives us all of the opportunities through the environment, He awakens everything except for one point, and this is the point of our free choice. So through connection with a group, I find my new form. He molded me up to here, and the search for the next form is “my true self.” I organize, research, and am found in development, in a search for my most advanced form. This is the principle of “there is none else besides Him” (Deuteronomy 4:35); we are constantly working with the help of the Surrounding Light in order to reach the Inner Light.